This weekend, I've been all screwed up on anime and Street Fighter. I also practiced driving, Japanese, and the mixolydian scale on guitar. These are good things. Still I was all screwed up, bleary-eyed at dawn with visions of school girls firing energy blasts at muscular men in white karate gis. Do monsters stalk street corners at night? Did Elvis die? These are questions that need answers. You won't find the answers here. While salarymen costumed themselves in ties and black trousers, I did sit up wondering what the hell I was doing these days. After putting my own weird wardrobe of punk/closet-queer boy/rockabilly/nerd junk away, I found something that took me back to older bleary-eyed days of night-time mysteries. Many years ago, a friend and I would sit up all night discussing the paranormal and the supernatural, and one day he handed me a really weird little booklet. I don't know if it was serious or not, but the text described a robotic killer or something that was thought to come from a university, I think CMU. I never really read the whole thing. Well it turns out that I live a few blocks from a robot lab owned by CMU. There have certainly been nights where I walked past the walls and wondered what dastardly replicants were being assembed inside that would one day be dismantled by a post-noir detective in our increasingly cyberpunk world. Just the other day, I posted a picture of some ugly, boxy, condos that look like they'd exist in that same time and place. These things are coming up all over. Truly the future has arrived. Of course the future was already here in some form as Robotic Music of Pittsburgh proves. This record was released back in October of 2009 on the mysterious Specific Recordings, but Bandcamp threw it out to me as a "new arrival". It must be fate! I think it's really just only been now posted on Bandcamp. Robotic Music of Pittsburgh is an album of musick "played on physical instruments by robotic or mechatronic performers". The cover is a throwback to the harsh Pittsburgh of yesteryear when steel was the king and everybody died with lungs full of soot. You could ask my great-grandfather about it if you were dead. Thank God that that orange guy is bringing all the soot back, so we can all ask my great-grandfather about the steel mills and stuff once we are dead. Thank God for environmental waste and a backstep for human health! Thank God (or Christ) for the bomb. I like the cover to this album. The album starts with a track by Richard Pell and Matthew Mesner called "Robotic Player Piano". "Monday, January 4th 1999", a voice says, and then it's all controlled chaos of flying ivory keys. There's a swirly mid-range with twinkling somethings above. The first track is not even a minute long. The second track is attributed to Ben Brown, Garth Zeglin, and Roger Dannenburg and titled "McBlare Robotic Bagpipes". It's another short track, sounding like something John Cale might have produced on viola. The machines drone and blare. They don't rock. The longest track is "GuitarBot" by the League of Electronic Musical Urban Robots. It's quite beautiful. I love the sliding guitars, all hollow and slimy, accompanied by a bullish upright bass. As the song continues, it sounds as if there is a keyboard or an EBow or just some really extreme sustain. The musick ranges from meditative to jolting. After a brief silence, Jeremy Boyle w/ Robotic Guitar and Drums produce a track of the same name. This is the final piece of musick on the album, and it is the most like a typical song. The machines really can rock. The guitar rolls over in waves as the drums sound, well, like clockwork. Some other guitars come in with a counterpoint and semi-solo. There might be a keyboard here, or it is another guitar all covered in amber light. I enjoyed this one very much. 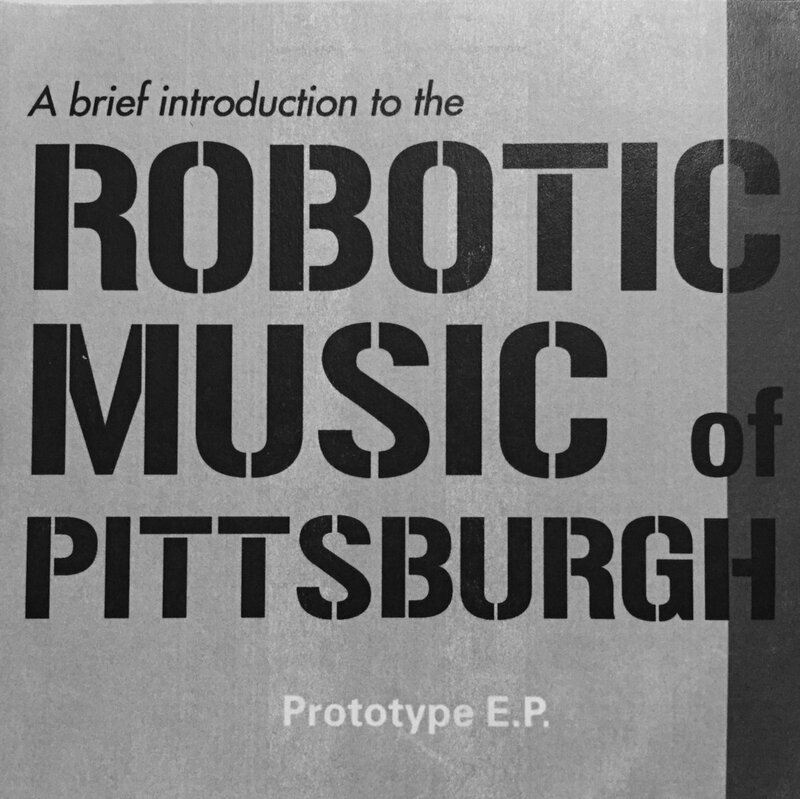 I'm glad that I found this sampler of Robotic Music of Pittsburgh. There is an air of mystery to it. I could not find much information other than a short article written by Manny Theiner for the City Paper concerning the output of the label. Specific Recordings is certainly something I will watch out for from now on. The robots here on Robotic Music of Pittsburgh do a good job at making musick. Were any of them built close by? Label owner Richard Pell does have connections to CMU, so there is certainly a chance. Thus the mystery of the man-eating robots of CMU was finally solved. They are really just musicians taking all the gigs away from human bands. That's just the way of the future, isn't it? Robotic Music of Pittsburgh receives a Good.